This performance will be in Hebrew with English surtitles. This performance contains adult subject matter and haze. Daily life is complicated, dangerous, and full of yearning.The living and the dead; dreams and waking life coexist in an uneasy world overflowing with absurdity, humor, sadness and compassion. We encounter a strangely endearing group of imprisoned misﬁts hell bent on holding a mirror up to nature and smashing it into smaller shards. The only way they can free themselves is to allow the release of these stories, no matter the cost. 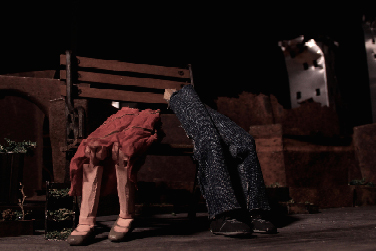 Adapted from acclaimed Israeli author Etgar Keret's book of short stories, this multimedia performance inventively combines puppetry, theatre and film, exploring what happens when the story begins to control the story teller. The development of this piece began during Zvi Sahar's teaching residency in the School of Theatre, Dance, and Performance studies in Spring 2017, working in collaboration with UMD students and faculty.